You don’t need a ton of space to be creative. Now, that isn’t to say it wouldn’t be nice to have a sprawling studio in which to exercise your creativity, but it isn’t necessary. I live in an 850 square foot house. We have two bedrooms that are busy being bedrooms. I’m steadfast in my conviction that a bedroom’s sole function is a place for rest. I don’t want it to be a room that I associate with work, or I won’t be able to sleep through the night. My husband and I were a little concerned when we first looked at our house that it would be too small for our needs. But it has an expansive back patio and a saltwater pool and spa, so we decided we could compromise on space in order to have this backyard paradise. I had to get creative about my creative space. 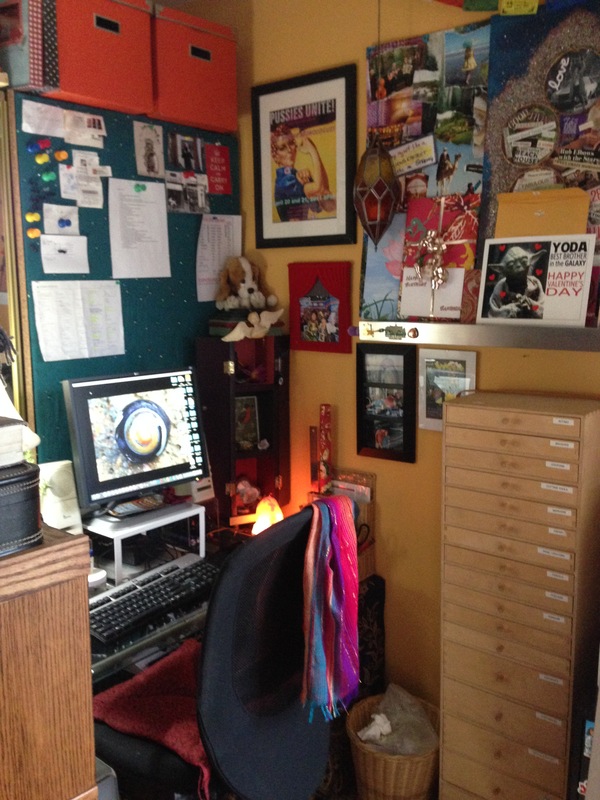 I work primarily from home, so I’m adamant that I have a space that is all mine – nobody else is allowed to put their stuff in it! I have managed to carve out my own little place in our living room that is 25 square feet. And it even feels private, like I’m in my own little room! 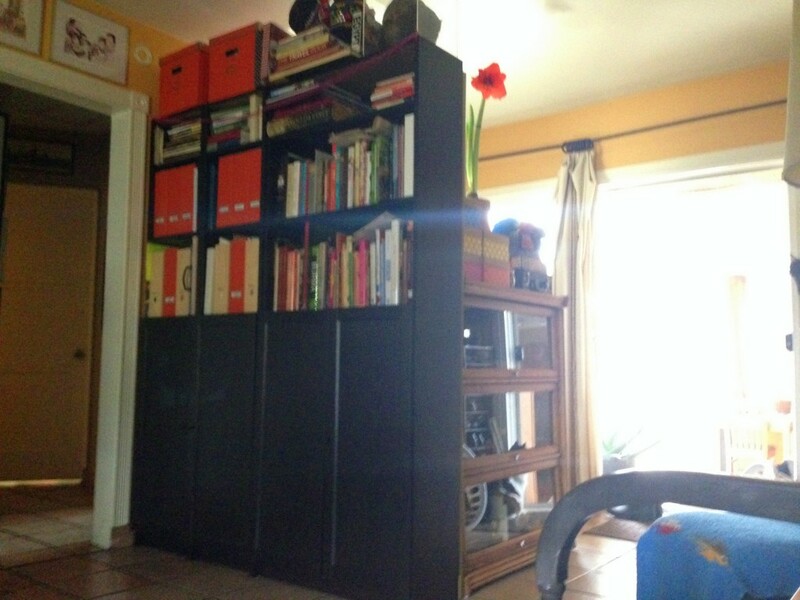 It just needed a couple of well-placed bookshelves to create the desired effect. That’s my office/studio behind there! I work in here every day, and even recently completed the first draft of my first novel from this space. 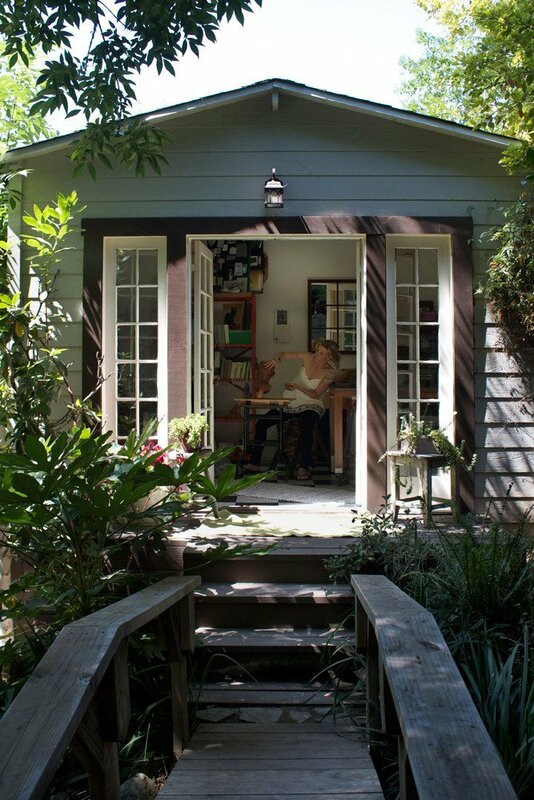 I blog from here, I make art from here, I daydream in here. 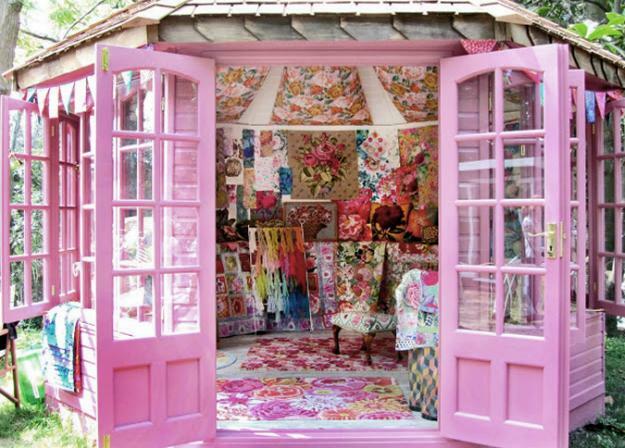 Would I rather have a space like this? You bet. And I’ll keep visualizing those things until I have a dream studio space one day. But I’m not going to let my lack of space get in my way of being creative now. 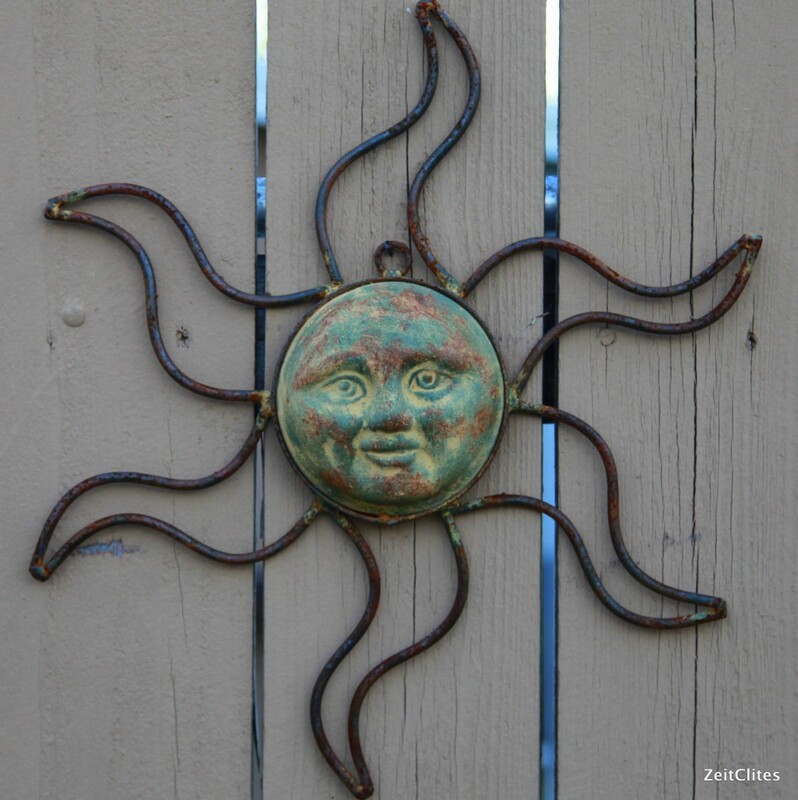 Think you don’t have the space to carve out your own little sanctuary? I challenge you to reconsider. I suspect that you have a nook or cranny somewhere that you can claim. A closet? Underneath a stairwell? A corner in the kitchen? Let your imagination go, you never know what you’ll discover. 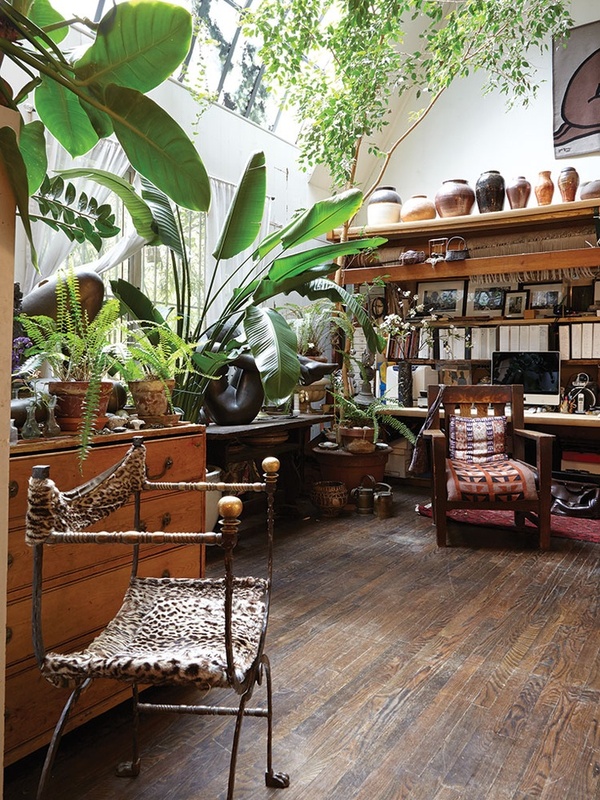 Do you have a tiny creative space that you love? Please share! It’s wonderful inspiration to see how everyone else makes use of the space they have. I’m in the thick of editing my first novel, and it is proving to be a more daunting challenge than I may have originally expected. 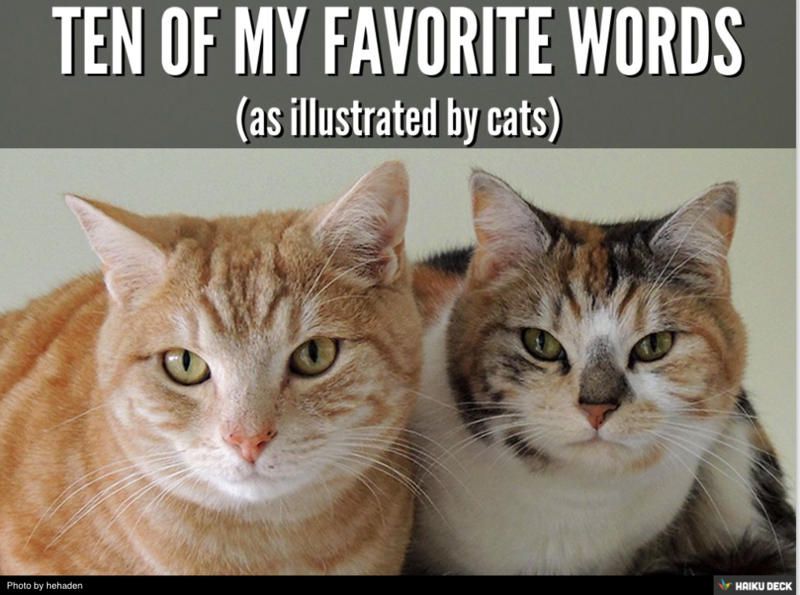 First – all those adverbs! Ack! When I wrote my first draft I consciously (there’s one again!) tried to limit adverb usage, knowing that it is better to show, not tell. But there are still so many! I know that is partially because in my haste to get to the 50,000-word finish line of NaNoWriMo I sketched out some sections instead of fully writing them. So I’m trying to look at this as an opportunity to better tell my story. I’m new to novel-writing (writing a novel is novel to me, heh). While I’ve been a storyteller for some 20 years, this is my first foray into this medium. There are so many different tips and rules to think about! I’m no stranger to story and character development, but novels have their own kind of structure. I’m finding it necessary to consult the hive mind of the Internet to glean some of the information I’m lacking. While I, by no means, have even scratched the surface of writing resources that are available online, I have found a few that have been especially helpful thus far. In no particular order, here are my top 5 favorite editing tips and tools I have found on the web. Having never written, much less edited, an entire novel before, I had no idea where to start. My novel falls under the YA umbrella, and generally follows a linear story told in the first person present tense. I wanted to find a clear, concise, and above all SIMPLE recipe for editing what is a pretty straightforward story. Junkfoodmonkey gave me just what I was looking for, and so far the method they lay out has not steered me wrong. If only I had found this BEFORE I started my first draft! There’s some really great advice in here. When I wrote my first chapter, I had the feeling I would be scrapping and rewriting it in later drafts, much like a theatre director will restage the first scene of a play once the whole thing is blocked. I had almost talked myself out of totally revising my opening chapter, but reading this post confirmed my intuition that my first chapter needs to be AWESOME and that I should spend a good amount of time reworking and polishing it until it shines and makes the reader want to keep reading. This is a great tool once you’ve gotten to the line editing process (or at least I think it will be, I’m not to that stage yet). I’ve already noticed in my second read-thru that I really like the words JUST, SUDDENLY, and ILLUMINATE, for example. I’ve also got some run-on sentences and a cliché here and there. This list will be a good reminder to check for all these things in subsequent readings, to make sure my prose is clear and tight. Again, this might have been a good post to stumble upon while writing the first draft, but these are some great tips and tricks that I can still implement. I got a real baddie in my book, and although he is a power-hungry, larger-than-life villainous dude, he is still human. When I rewrite I’m going to look for opportunities to show his humanity and his vulnerabilities. I’m also going to take some time after this read-thru to work through an in-depth character description, which I didn’t do in my haste to finish the first draft. Did I mention how I love the word JUST? Yeah, not a power word. This list, and my thesaurus, will be my companions when I reach the line-editing stage. I want my sentences to pack an emotional punch, and carefully choosing the best, most descriptive words is a huge part of that. What did I miss? 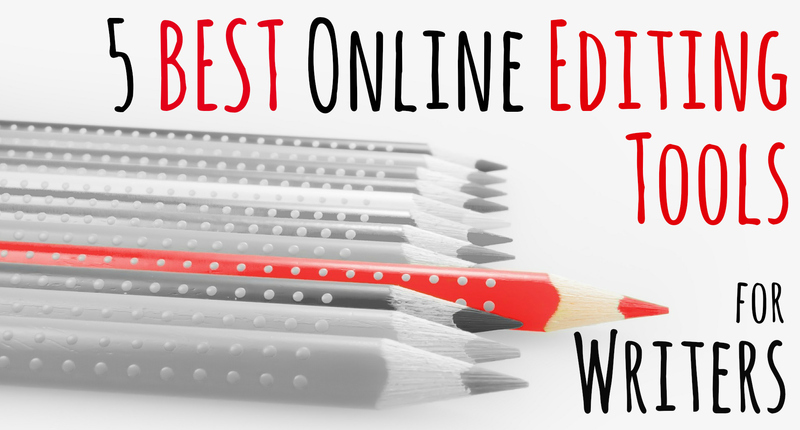 Do you have editing or revising tools and resources that you love? Please share in the comments! I’m always on the lookout for good advice. Winter is my second favorite time of the year in my Southern California garden. It can’t beat spring, because it is just…well, it’s spring! Spring is cool mornings and warm breezes and an explosion of growth and color and texture and it’s all just magical. But winter does not follow far behind in my esteem. Winter holds the promise of spring. And while we may have a night or two with temperatures plunging below freezing, and I may lose a plant or two as a result, there are still things growing out there, telling us all that if we wait just a few more weeks the world will suddenly be resplendent. Sometimes anticipation is sweeter than fulfillment. 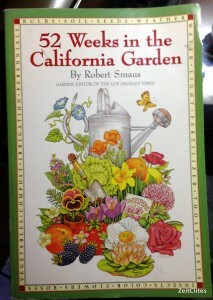 It’s usually about this time of year that I pick up my Garden Bible. I found this book at a garage sale about three years ago. I paid exactly $1 for it. Of all the books I own, this one is probably the most valuable and has given me the biggest bang for my buck. My one buck. 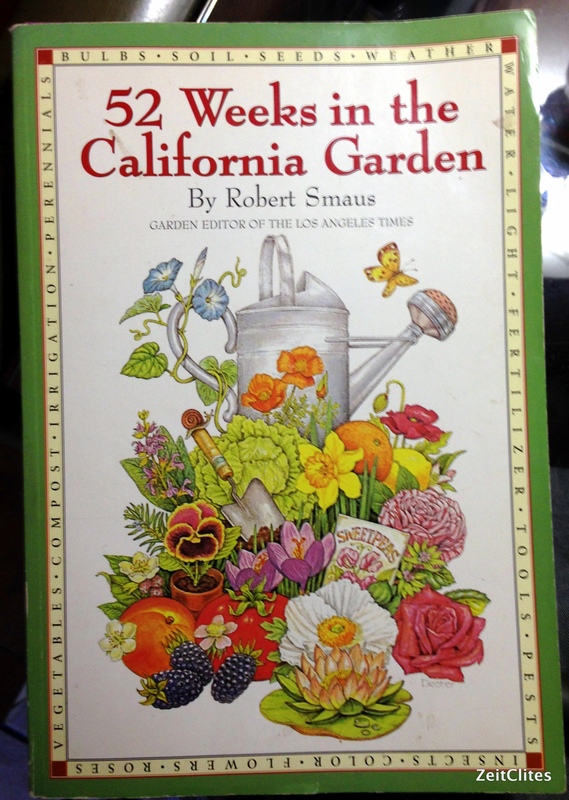 It‘s written by the garden editor of the Los Angeles Times, and it simply lays out, week by week, what gardeners in California should be doing in their little patches of earth. It lists chores, what to plant and when to plant it. It offers clear advice on what grows well here, and why. 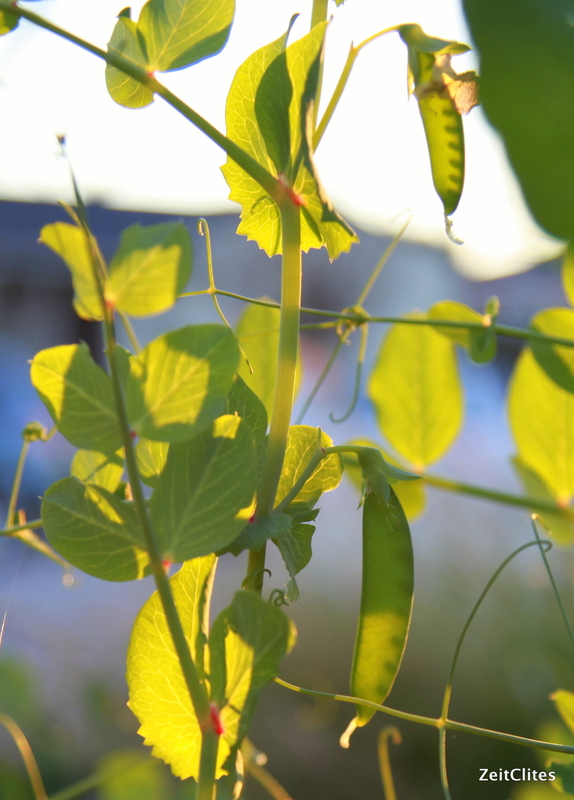 It is a book that has helped me become more methodical in my gardening, and the results show. Care to take a little tour? My backyard is a concrete jungle, save for a small strip of dirt. 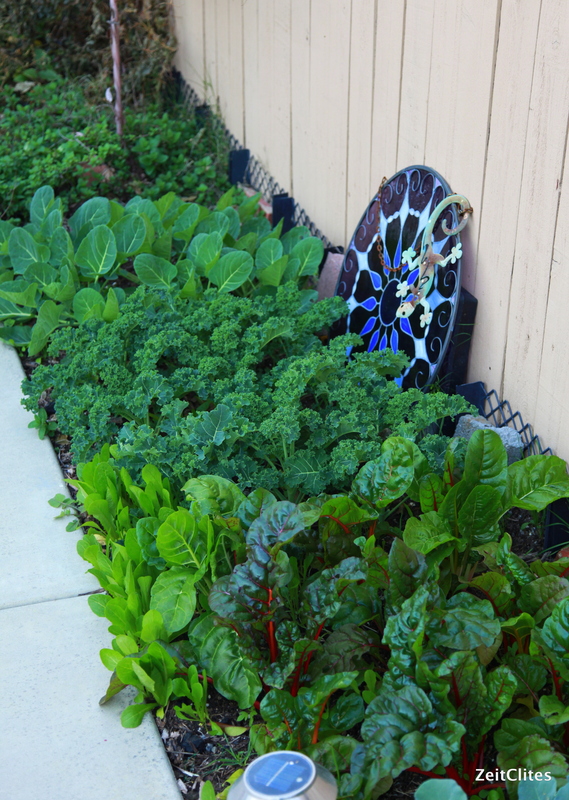 I decided there wasn’t any reason that tiny patch couldn’t be an awesome veggie garden – and it is! Especially in winter, when it’s not so scorching and dry. I’ve got it on a drip irrigation system so I just pretty much let it do it’s thing. I’ve stapled nursery flats along the bottom, because my neighbor’s pit bull, Skittles, likes to dig. Right now, I’ve got mint, Brussels sprouts, kale, rainbow chard, broccoli and cauliflower growing out there. There’s also some volunteer lettuce peaking up through cracks, from the lettuce I let go to seed in the summer. Most of the gardening at my house happens in the front yard, out of necessity. I’m a big advocate of growing edibles in the front yard, and try to choose those that are most ornamental. These spring peas are awfully pretty crawling up a spherical trellis Hubs picked up for me from a garage sale (garage sales are garden goldmines!). 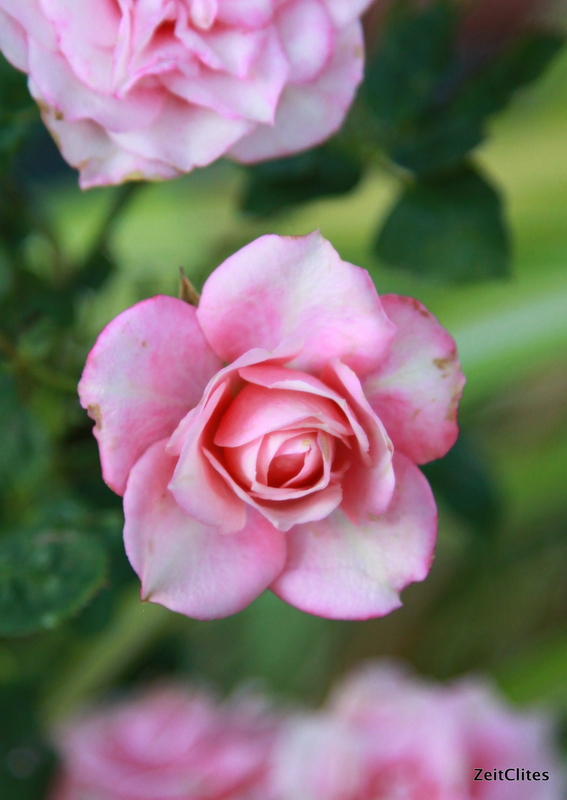 January is the month to plant bare-root roses in California. It is also the month they start to wake up. 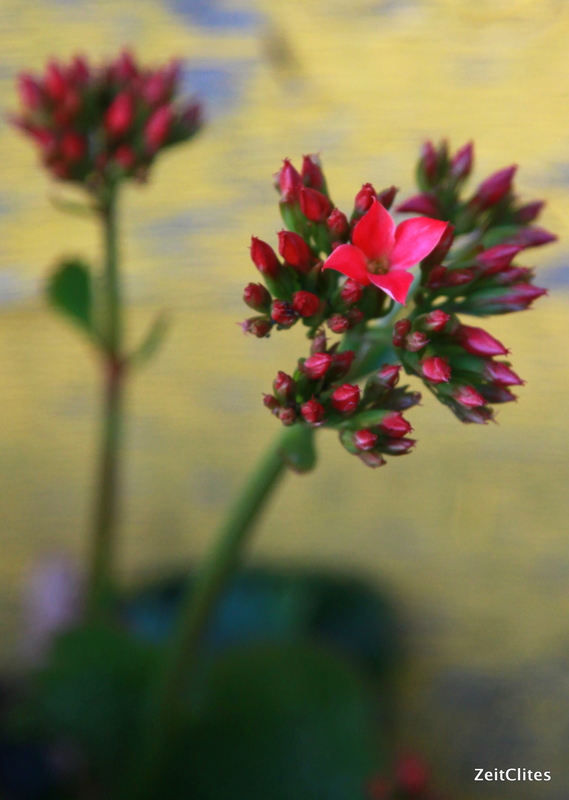 I only have four bushes – one of them miniature – but they provide just enough blooms to collect for a twee little burst of color on my desk. January is also the month where succulents take center stage. I have several varieties in my garden, due to the ease of propagation and their drought-tolerant lifestyle. Many of them are coming into bloom now, including the aloe and the ice plant. 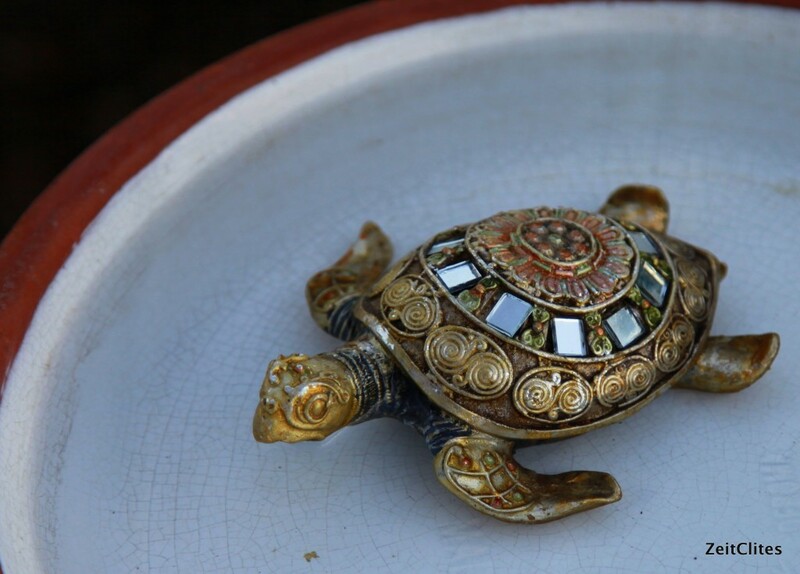 I’m not even sure what this little guy is – again, I bought it at a garage sale – but it sure is pretty! 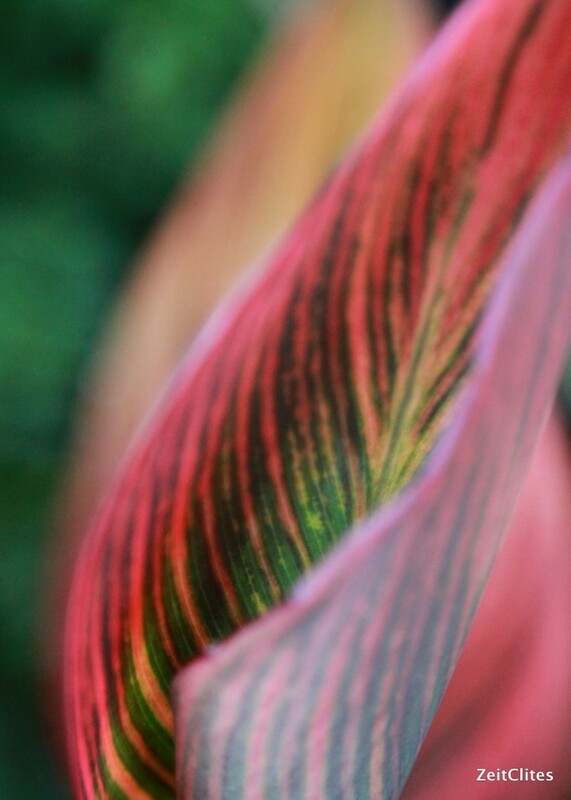 Many of the perennials are dormant in January, but there are one or two that are coming alive, such as this gorgeous canna lily, which boasts the most colorful leaves in my garden. 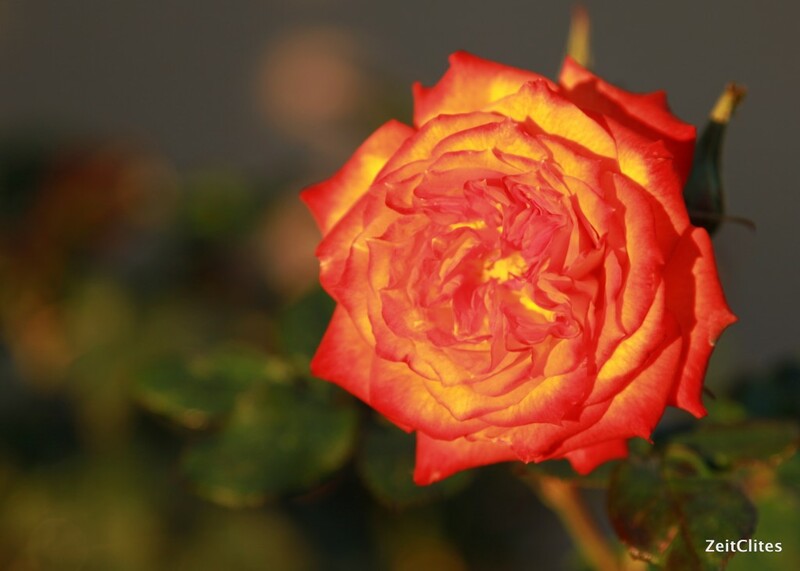 Later in the year it will bloom with a magnificent and soft orange flower. Last, but not least, we can’t forget about the birds! I have a few feeders and birdhouses in my garden, as well as not one, not two, but THREE birdbaths. I finally got around to cleaning them and filling them with fresh water yesterday. I can’t wait for the birds to discover them. Watching them play in the water always brings a smile to my face. And in this particular birdbath, they have a turtle friend. He’s very shiny and colorful and came from the dollar store! I hope this helps those of you who may be experiencing the winter blahs right now. And if you’re in my neighborhood, stop by for a garden respite! I’ll make you some kale chips! This weekend, I invited one of my favorite people, Kristina, over to my house for a crafternoon. 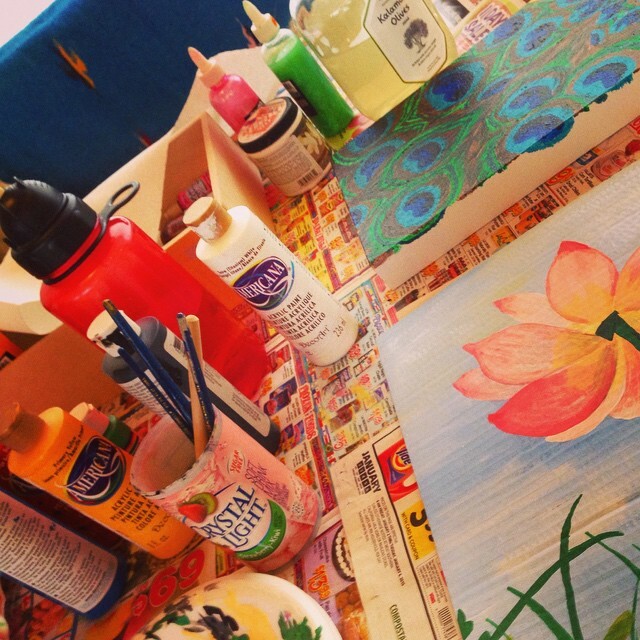 What is a crafternoon? Well, it’s just like the name suggests – it’s an afternoon spent making something crafty. I find crafternoons can be most enjoyable when done with friends. Not only do you have some lovely little thing to show for your time, but you also get to chat and catch up with your pals. It can be better than a night out drinking with your friends, where all you may have to show for it is a hangover and some fuzzy memories of behaving inappropriately. I hadn’t seen Kristina since the holidays, and I was itching to make something with these little hands of mine, so I figured it was time to host a crafternoon. 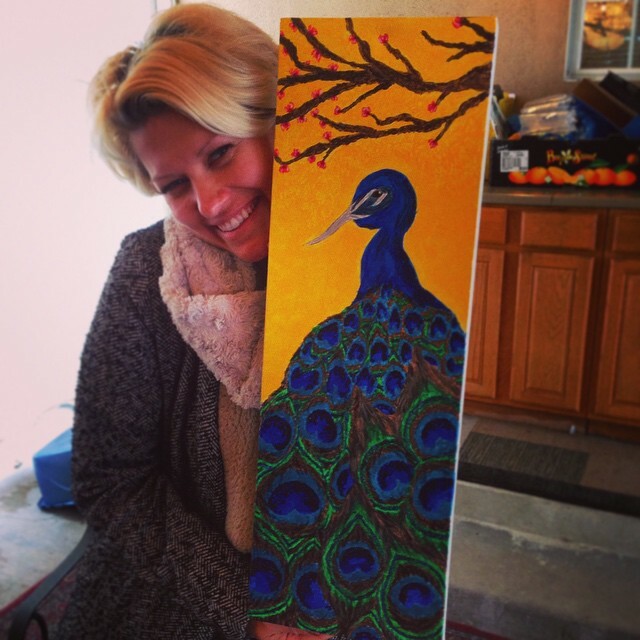 Kristina had a half-finished painting in my shed she had been working on over the past two years of crafternoons at my house. I was excited for her to finish it. Hosting a crafternoon is easy. I set us up on my patio outside (my husband was awesome and set up a couple of heaters for us so we wouldn’t freeze, it was actually a cold and rainy day here in Los Angeles). I covered the table with newspaper, gathered up all my paints and brushes, set out a couple of recycled jars filled with water, put out some paper towels, and we were ready to go. You don’t need anything fancy. Some of my paint is ten years old, purchased at Michaels for some project or other. I think some of my brushes came from the dollar store. Sometimes crafternoons also include wine and snacks, but since both of us are on a clean-eating kick for the New Year, we sipped juice and water. You can do whatever kind of creating you want, but since Kristina was going to be painting, I thought I would paint as well. It’s not a craft I participate in frequently, as I don’t have any real skills or training in it. But I find it so therapeutic. 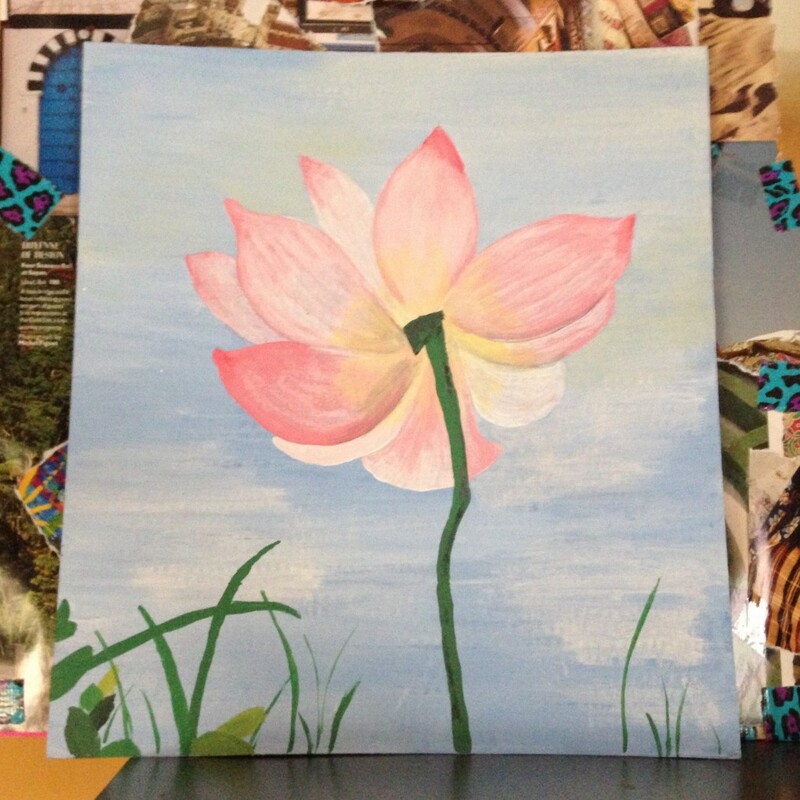 I found a simple picture of a lotus flower on Pinterest that I liked and thought was doable with my limited ability, and saved a pleasing square of cardboard on which to paint that had come with a wall calendar my stepdaughter had received for Christmas from my parents. Even if you have no creative skills whatsoever, I highly recommend setting aside some time every once in awhile just to craft. In fact, people are beginning to study the positive effects crafting can have on your health. It’s a mood-boosting, stress-reducing, drug-free way to feel better. It forces me to slow down. It’s impossible to paint detail if you are racing around like a maniac. I can simply sit in one place for a couple of hours, breathe more deeply, and relax. It soothes me. I find the physical act of putting a brush full of paint onto canvas, paper, cardboard, whatever, so calming and satisfying. There’s something about that gooey, colorful stuff spreading out before me that lights up my brain in just the right way. It allows me to look at something with purpose and intent. Have you ever looked at a flower, I mean, really looked? 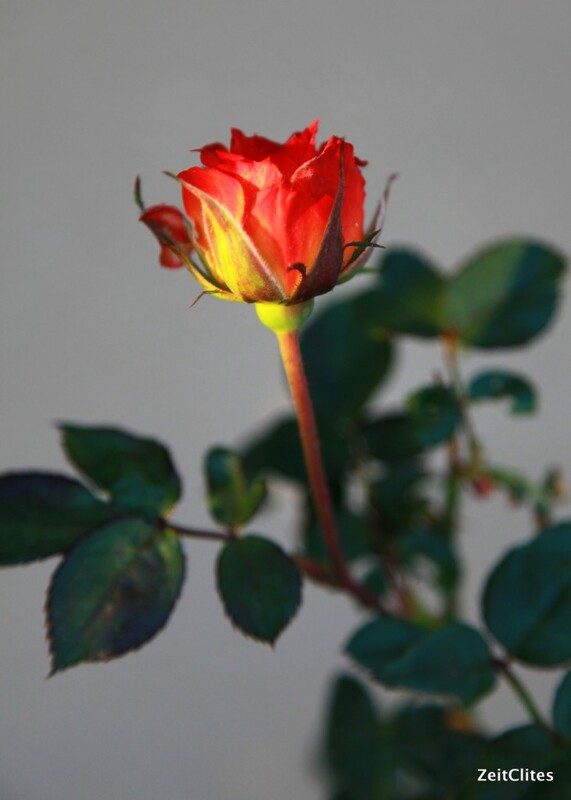 Have you noticed how the light hits the petals? How each petal has its own unique, subtle coloring? How sometimes the stem doesn’t grow straight? Really noticing these things allows me to look at our world with different eyes, and consider the circumstances which brought this object to this space in time. What causes those color variations? What environmental factors caused the stem to have a bend in it? How does this flower turn to face the light? Do you have a favorite type of craft you enjoy? 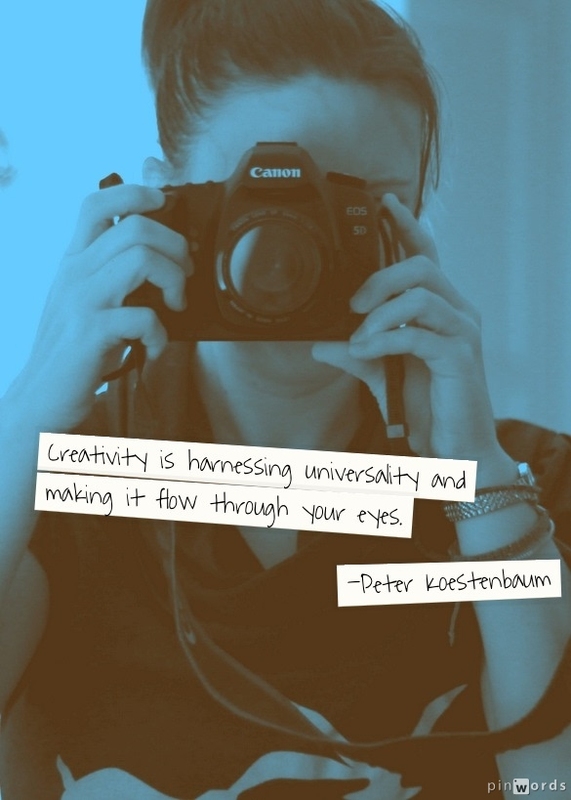 How do you allow your creativity to enhance your health and well-being? My finished lotus flower, now sitting pretty over my desk. Since this blog is predominantly a writer’s blog, I thought it would be fitting to share with you what I’m currently reading. 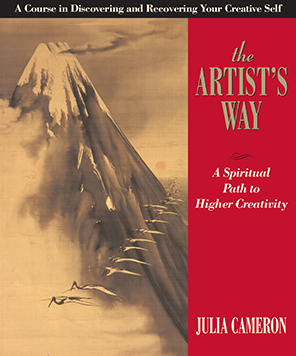 I know I’ve said this before, and perhaps I have gone on about it a little like a broken record, but I’ve got a well-loved copy of The Artist’s Way by Julia Cameron on my desk. I took myself through the program from August to November, 2014, and while you could say I’ve “completed” the program, it’s something I want to go back to again and again. It saved me. Last summer was tough, fraught with problems I never thought I would have to tackle in my lifetime. 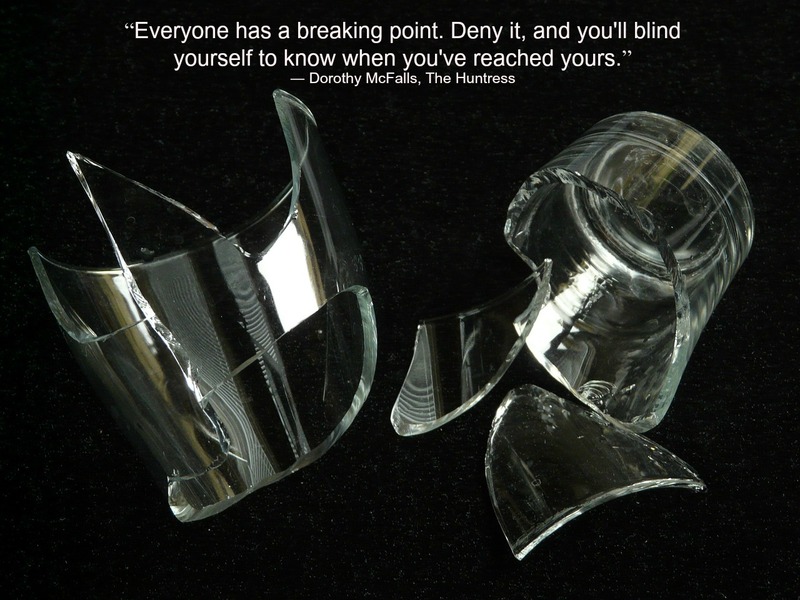 It depleted me in every sense – emotionally, creatively, energetically. I bottomed out in August, after one-too-many rejections in my acting life. I had an idea for a book I kept trying to start and just couldn’t, I never seemed to get around to shooting new episodes of my web series “Bertie and Margie“, and I felt I had a big, steaming plate of nothing in front of me. I belong to a loosely organized gang of creative beings called the Creative Women’s Circle, where we talk about our creative projects, successes and failures, and find ways to egg each other on in our endeavors. In our meeting that month I talked about how I was working on nothing, felt like creating nothing, and had come to a total creative standstill. And I felt very apathetic about the whole thing. One afternoon late in the month, after a particularly challenging day of doing nothing and accomplishing nothing, it suddenly occurred to me to pick up The Artist’s Way. I had had the book for 15 years, it was recommended reading in graduate school but I had never gotten around to it. That book had been on the chopping block countless times over the years when desperate circumstances found me selling books online for a quick buck, but it was always spared that fate. Some little part of me inside felt it just wasn’t time. I’m so grateful I never let that book go. I picked it up on a stifling afternoon in late August and began the program that very day. I could get all preachy and proselytizing here about how it transformed me in those dark days. 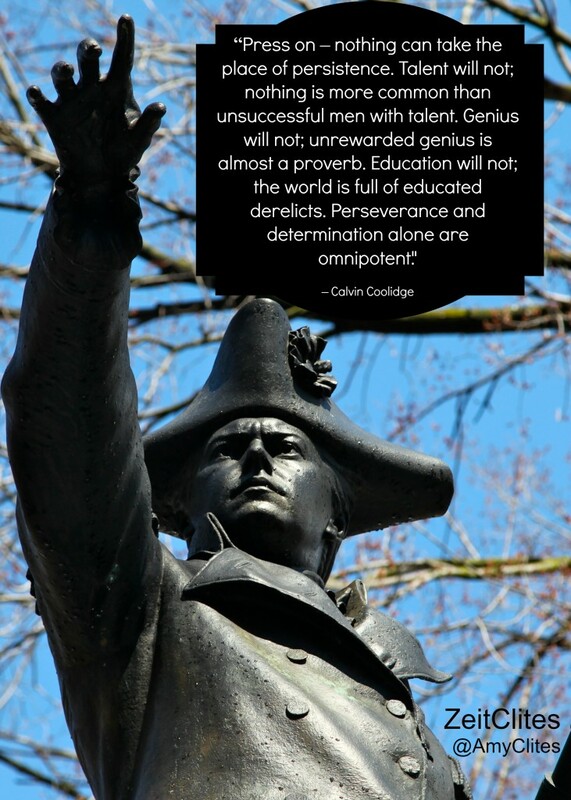 Or you could just look at some of my previous posts like this one or this one that were inspired by the lessons I was working through at the time. I began to remember how to look at the world with joy and love again. The Artist’s Way is an incredible resource for blocked creatives. It has been a life-saving tool for me. I honestly would never have written a novel last year if I hadn’t thought to pick up this book. If you need a lifeline, I can not recommend it highly enough. It saved me, and I believe it has the power to save you, too, if you need it. Today I start the process of rewriting my first novel. I’m slightly intimidated by the process, but my enthusiasm remains in check. I’ve got 50,000 words of a Young Adult novel sitting here on my desk, courtesy of NaNoWriMo, and I intend to do something with it. I read the whole manuscript from cover-to-cover in one sitting over the winter break. To my great relief, I was not cringing at every other sentence, nor did I feel the whole endeavor was pointless and that it was time to throw in the towel. If anything, it invigorated me. I’m intrigued by these characters, and want to do them justice. 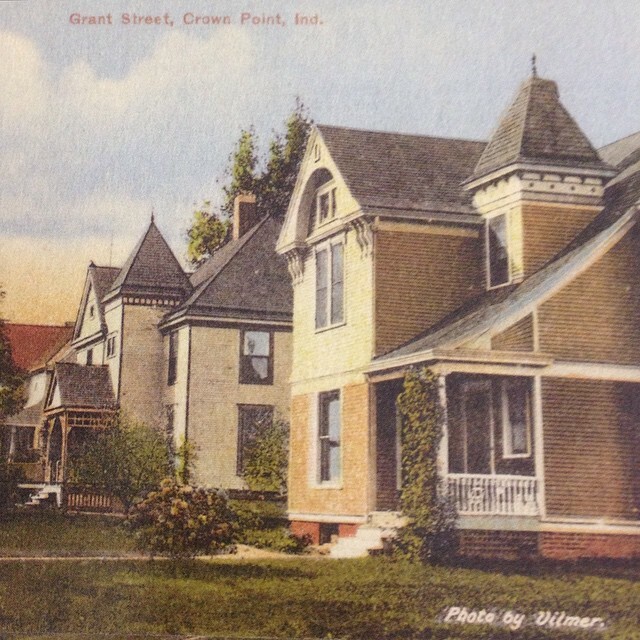 My novel takes place in a fictional northwest Indiana town that is closely modeled to my hometown of Crown Point. I spent 10 days in CP over the holidays, and felt closer than ever to the lives of these people I have created, and even more connected to the world in which they live. I’ve always had a bit of a love/hate relationship with my hometown. Doesn’t everybody, I suppose? Family is the center of life there, and I was lucky to have a warm and insulating throng of my own. But as I got older, the town felt stifling and I longed to know more, see more, of the greater world. I left when I was 18, and have only been back periodically for visits. Having that space ,that time away, gives me to the opportunity to feel like a visitor whenever I am there. The town was incorporated in 1834, and you can see and feel the history all around you, yet things continue to change, as they do. I love to explore when I am there, especially the town square. Crown Point has a grand old courthouse in the center of town, flanked on four sides by various and sundry shops, including a movie theater. When I was kid my mom and I would shop at Lipay’s clothing store, and I took dance lessons at Miss Shirley’s which was directly above it on the second floor, next to a health food shop. Ben Franklin, aka the “dime store”, anchored the southwest corner of the square, and every week my mom would go to Huber’s menswear down the street to pay on her cards. Today the square is a collection of home furnishings shops, restaurants, and bars. My favorite are the antique stores (there have to be at least a half dozen). On this most recent trip home, I ducked into one with my mom on a lazy Sunday to poke around. I really feel like I step back in time when I go in these stores in Crown Point. There’s a sense of living history there, and it overflows the shelves. The building’s themselves are alive with history, each having been built for a specific purpose, which has long been discarded as unneeded in today’s world (goodbye apothecary shop, hello Copper Butterfly). In my novel, I want the town itself, and the buildings therein, to feel like characters. In fact, I spent quite a bit of time imagining and sketching out the details of the Victorian farmhouse in which my protagonist lives. That house in my imagination feels alive to me. So imagine my surprise, when poking through the antique store, I happened across a stand of reproduction postcards. 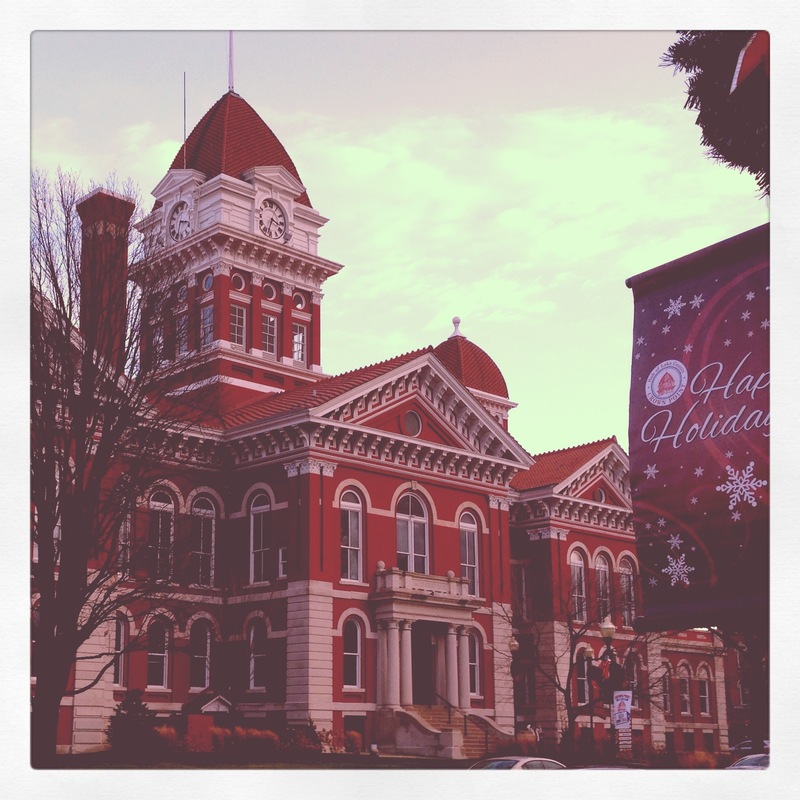 Most scenes were of the town square and the courthouse, and I lingered over them, taking in the details and the differences of days gone by. As I turned the stand on which the cards stood, I saw that among the postcards was one of a house. Something about it seemed familiar and I picked it up to get a closer look. My jaw dropped when I instantly realized it was the house where my best friend grew up, and where I spent quite literally hundreds of days and nights. A flood of memories of that house washed in, and while I could barely contain my gleeful enthusiasm, the shop clerk I was sharing with could not have been more apathetic. Ah, youth! Anyway, just today’s musings on how place has such a powerful influence over our lives, and shapes and colors the story of our days. I’m jumping into one of those places today, and look forward to sharing it with you in the coming months.